Whether in December or in February – the cold weather can surprise us at any time. Whether in December or in February – the cold weather can surprise us at any time. In order for you to safely reach your destination even on winter days, you will find in all our BMW and MINI snowbrushes, ice scrapers and wiping water with antifreeze. And after having done some “ice-skating work” on our cars, all you have to do is get in, feel cozy and warm and get started! If your car is missing an ice scraper or broom, please contact our service team via the app. We will immediately take care that the vehicles are newly equipped. 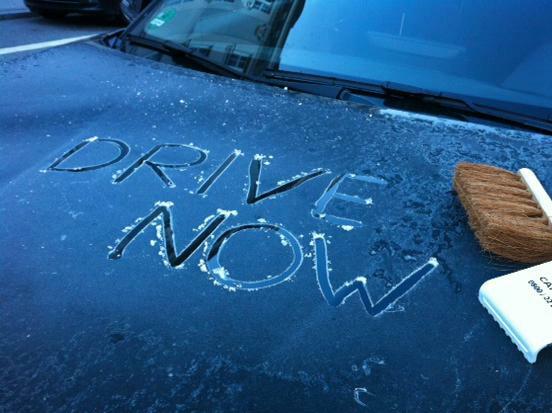 With DriveNow you’re safely taken care of in freezing temperatures. We wish you a good trip throughout the winter! You don't need a car? Not Possible!